CRI Online, 22 November Report (Correspondent: Zhang Zhe): On the 20th of November, H.E. 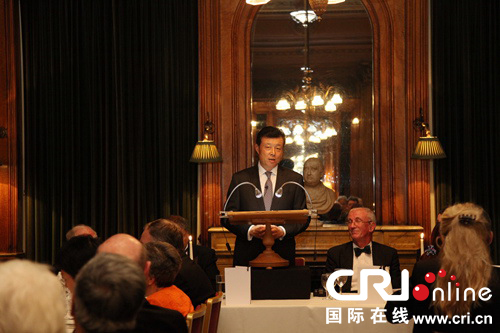 Ambassador Liu Xiaoming of the Embassy of the People's Republic of China in the UK delivered an speech at the time-honored Reform Club in the UK, talking about the latest developments in reform endeavors in China. In his speech, Ambassador Liu pointed out that the word "reform" is inseparable from the past 35 years of China's history. With the Third Plenum of the 11th Central Committee of the Communist Party of China in 1978, a massive reform programme across China was unveiled. Over the past 35 years of the implementation of the 'reform and opening up' policy in China, it has removed numerous constraints throttling productivity, catapulting China into becoming the second largest economy in the world and an engine of global economic growth. It can be said that reform has transformed China, turning it into a stronger and more prosperous country. In the past 35 years, China has resolved a whole host of old problems pertaining to its national development, and at the same time has encountered a raft of new ones. China provides an explicit answer to the question of how to tackle the difficulties that are arising in the course of development, avert risks and challenges of various kinds and promote a sustainable economic and social development. The answer is: to keep a strong confidence in reform and continue to push for reform with greater political courage and wisdom and more effective measures and approaches. Just last week, 18th CPC Central Committee held the Third Plenum. This meeting has attracted world-wide attention, as it drew up a master plan for comprehensively deepening China's reform. Ambassador Liu used three "Ds", namely "Determination", "Design" and "Deployment", to give a "3D" analysis of the results of the Third Plenum, the master plan and its implications. He said that the plenum manifested China's determination to promote foundational elements of social fairness and improve people's welfare, and on this foundation further determined to free up the fixed mindsets and overcome institutional drawbacks. The Third Plenum highlighted "top-down design" and clearly proposed to strengthen the combination of "top-down design" with "cross the river by feeling the stones", and stressed the need of optimising decision-making, building broad consensus and forming a synergy in reform. In addition, systematic measures were made to deepen reform on all fronts and decisions were made on 55 major reform tasks and over 300 measures in 15 sectors. There are not only specific targets, but also a specific timetable. The timetable gives a schedule to accomplish all reform tasks and achieve conclusive results in key areas by 2020. This means the reform process will be both measured and evaluated. Third Plenum has sounded the clarion call for a new wave of reform in China. Just as the title of an article in Economist magazine put it, "China paves the way for reform." The reform of the last thirty-five years has brought China out of poverty and backwardness, the second round of reform from this Third Plenum will realise the great revitalisation of the Chinese nation, The reforms will make true for China's 1.3 billion people – the 'Chinese Dream'. In his address, Ambassador Liu also pointed out that reform cannot be accomplished at one stroke. Nor can it be done once and for all. Deeper reform in China will not only bring a strong impetuous to the further development of China, but will also provide many more opportunities for China-UK cooperation. Early next month, Prime Minister David Cameron will visit China. He will take business leaders from every sector, large and small. Reform would surely feature prominently in the talks between the leaders of our two countries. The two sides will update each other on their respective views and experience of reform, have in-depth discussions on the new openings brought about by reform in both China and UK and jointly draw up a blueprint for the future of China-UK cooperation.